I don't want to sound like an old curmudgeon, but if the news is any barometer, people are taking their clothes off more than ever these days. There are also more choices for underpants than one would have thought possible a few years ago. In any case, the fact that people are dropping trou and showing off their chones helps illustrate a point I'm trying to make about the Ultimate Writer's Environment. Is there such a thing? A place you can go to, rent space in, and guarantee that you'll turn out the Great American Novel? Some people seem to think so. 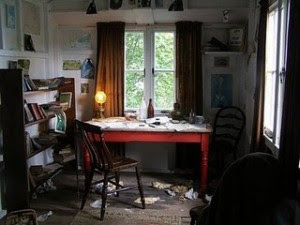 Too many people try to emulate the style of what they think a writer should have - a perfect kneehole desk, pens that cost an ungoldly amount of money, linen paper, expensive laptop, special authoring software. As if the process was more important than the result. I hear endless debates about the perfect app for writing a novel or a screenplay and too few debates about how to get out there and write the darn thing. So as a public service, I'd like to give you the secret to the Ultimate Writing Environment, and here it is. The Ultimate Writing Environment is wherever you do your work best. That's it! If you're looking to write a novel or screenplay, wherever it's easiest or most effective for you to do your work, that's your Ultimate Writing Environment! It's a personal choice, this Holy of Writing Holies, this sacrosanct area of literary imagination. You don't need to buy any particular pen or software, you don't need to listen to a specific Spotify playlist; you just need to work and by working, figure out where it is easiest for you to do so. For any aspiring writers out there who are contemplating any major lifestyle changes in order to accommodate their writing craft, I'd like to do you a favor and stop you right there. You don't need to do it, it isn't necessary. Pull out a sheet of paper, open up Microsoft Word, heck: pull out your Granddad's old IBM Selectric typewriter - if it was good enough for Hunter S Thompson, it's good enough for you. Here's another thought or three: Sound or no sound? Do you need music? Do you need silence? I have no idea - you'll figure that part out. Basically, it boils down to this - when you can crank away at whatever you want to write, the circumstances that allow you to do so are the perfect ones. Maybe it's a noisy coffeehouse, maybe it's a Laundromat - maybe it's a double-wide trailer at 2am. Steven King wrote his first novels using a typewriter on a children's desk, so I'm not going to tell you 'no' when you say that you need X, Y and Z to do your best work. If you take nothing else from me, let it be this: the Ultimate Writing Environment is a personal choice - as personal as your favorite kind of underwear. As long as you're happy with it, as long as it feels comfortable and allows you to move like you want to move, I'm here to say: Do it. Daniel Haight is the writer of the Flotilla Series, a dystopian fiction story about a boy surviving the end of the world on his dad's old fishing boat. His second installment in the series IRON MOUNTAIN is coming to stores in a few weeks and he's building an tribe to re-shape the world of sci-fi. Learn more about Daniel online.